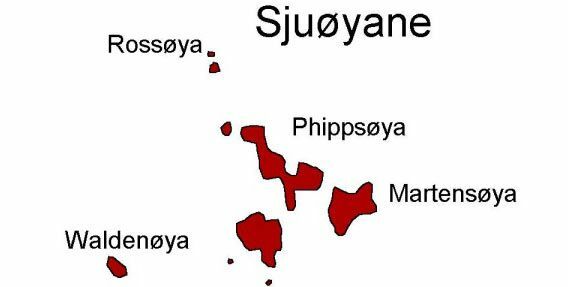 General: The name Sjuøyane means ‘Seven Islands’ – there are some more or less, that depends on what is an ‘island’ for you. The Sjuøyane are the northernmost part of the Svalbard achipelago; little Rossøya, more a skerry than an island, is on 80°50’N. It is the northernmost land of the Sjuøyane and thus of Europe. Ice conditions are often difficult, but they are often earlier accessible than other parts of Svalbard further southeast because of the influence of the last drops of the Gulf Stream. The Sjuøyane belong to the Northeast Svalbard Nature Reserve. Vesle Tavleøya directly south of Rossøya. Geology: Basement gneis and granite and many erratic boulders from northern Nordaustland. The colourful mixture of magmatic and metamorphic rocks, both solid bedrock and erratics, is quite attractive. Recommended book for further, well-digestable (really!) 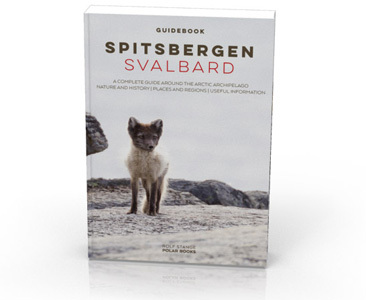 info about geology and landscape of Svalbard. 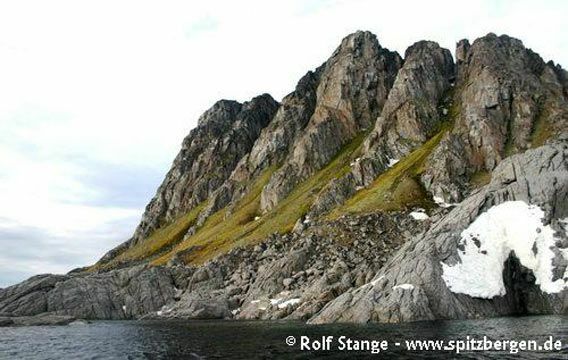 Landscape: Very barren, rocks landscape with some coastal plains, otherwise mountaineous terrain with steep slopes and markant plateaus on top; especially Nelsonøya has a very conspicuous shape similar to an old-fashioned top hat. 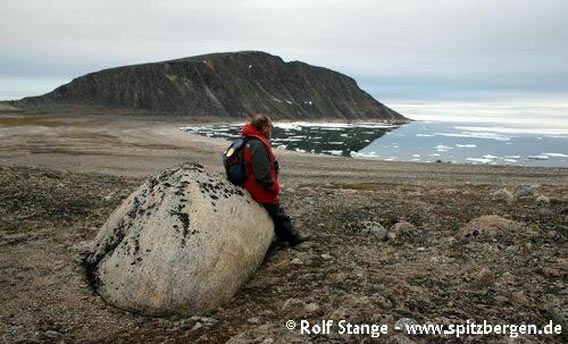 The lowlands are very attractive; very barren when seen just from the distance, there is actually a lot to see if you can get ashore: nicely visible old beach ridges, ice wedges, lichens and sometimes even some flowers, colourful rocks… all those small details. There is a lot of driftwood and unfortunately also trash on many beaches, brought up here by currents. There are no glaciers. The largest island is Phippsøya. Other islands are so steep that it is not possible to land there. 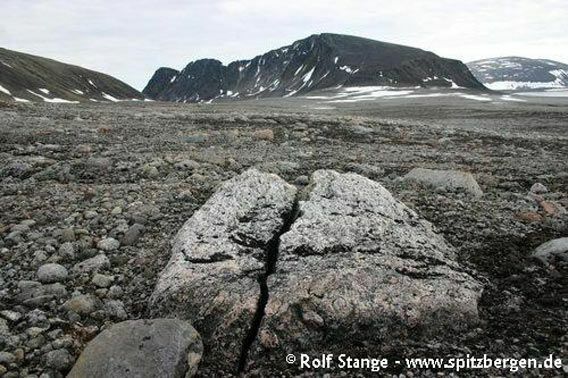 Barren polar desert on Phippsøya. Flora and Fauna: High arctic environment, very barren with little vegetation. There are mostly lichens and mosses which can be quite colourfull and in places Svalbard Poppy and saxifrages. There are small colonies of seabirds including Puffins and Ivory gulls. Herds of walrus are sometimes ashore, and polar bears are often around. History: The names of the individual islands tell quite a bit about the history. Phippsøya was named after the Englishman Phipps, who was in the area in 1773 during an attempt to reach the north pole, as was Parry in 1827, after whom another island is named… which one was it… yes, Parryøya. Nelson (yes, the Nelson) was on board one of his ships as a young midshipman, as the name Nelsonøya tells us. Legend has it that the young daredevil almost fell victim to an angry polar bear – that’s what the legend says, at least, be it true or not.